Lenovo ThinkPads are usually made for company buyers first and foremost, but there are some exceptions. The less expensive ThinkPad E series does target consumers more. A new leak reveals that the upcoming 14 inch model of this series will be released in a thinner variant. 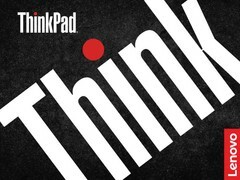 Not long ago, the first leak of the upcoming ThinkPad laptops ThinkPad E490 and Thinkpad E590 happened. Now, it seems like a third model will join the ranks of the affordable Lenovo ThinkPad E series, as the newest leak reveals the upcoming ThinkPad E490s. The basis for this leak are user manuals published by Lenovo on its own support site ahead of the official release of the ThinkPad E490s. To enable a thinner chassis, Lenovo had to change a few aspects of the design. The biggest difference between the E490 and the E490s is the lack of a 2.5 inch HDD bay on the E490s. The resulting empty space is used up by the battery on the ThinkPad E490s. For storage, it relies on a single M.2 2280 slot. 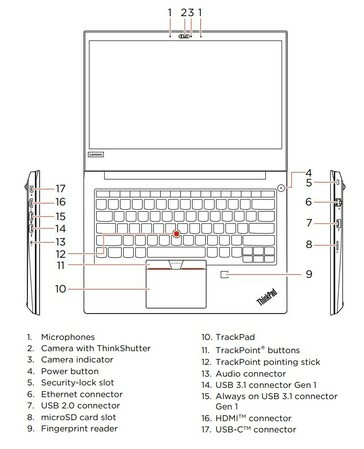 Also, Lenovo integrated the keyboard tray into the palmrest. This measure saves thickness, but it also makes exchanging the keyboard harder. Another design-change affects the bottom cover, which required the loosening of less screws to be removed on the Lenovo ThinkPad E490s. Apart from the thinner chassis, Lenovo appears to integrate some other features into the E490s that are not available on the E490. For example, the ThinkPad E490s features the "ThinkShutter", a mechanical camera-shutter that was introduced on the last generation of the more expensive ThinkPad T series. Additionally, all units of the ThinkPad E490s will feature a fingerprint-reader (optional on the E490) and every E490s contains a FHD IPS screen (1,920 x 1,080). The base-models of the E490 meanwhile are saddled with HD TN LCDs (1,366 x 768). The remaining specifications of the E490s and E490 appear to be identical. Both feature DDR-2400 RAM with two RAM sockets and both models will be available with a dedicated GPU – this time, it appears to be the AMD Radeon RX 550X. Although the leaked specs to not explicitly state which CPUs are used, there is little doubt that the E490s and its chunkier cousin will feature Intel "Whiskey Lake" CPUs like the Core i5-8265U. 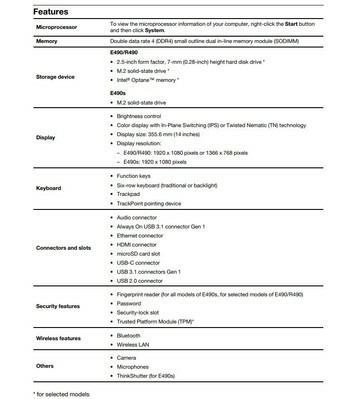 Its not clear when Lenovo will officially announce the ThinkPad E490s, E490 and E590. But since their support-sites are already online, an official announcement can not be too far away.